Kitchen : 12 indispensable tips for cooking that will save you so much time! 12 indispensable tips for cooking that will save you so much time! Great ideas that we would have liked to know before! We like to cook, but not waste our precious time. There are 12 great tips that will save you a lot of time when you cook. Try them and you'll adopt these tips! To avoid splashing when using a stand mixer, cover the whisks with a cardboard plate. You can say goodbye to the mess they use to make on the counter! Separating egg whites and egg yolks is what you hate the most? Use a plastic water bottle (empty, of course) and vacuum the yolks by squeezing the bottle. As simple as that! How do we know if our eggs are still fresh? Try this infallible trick. Place the egg in a glass of water. If it falls to the bottom, it is still good. If it floats, it would be better to throw it away. Do you need to soften your butter for a recipe? Place it between 2 sheets of parchment paper and roll a rolling pin over it. 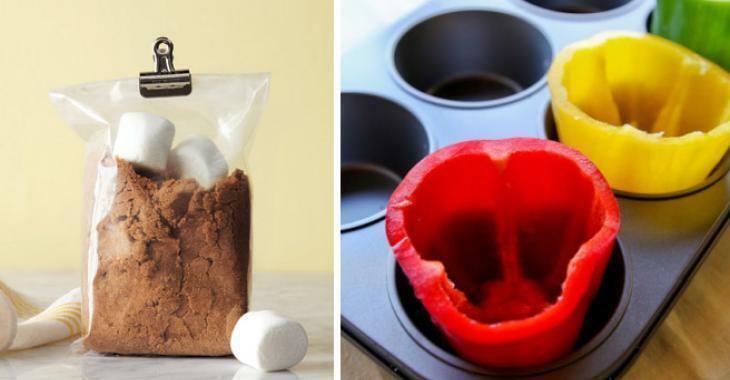 To make perfect stuffed peppers, use a muffin pan. They will keep their shape during cooking. This idea is great! If you want a lemonade, but do not have a lemon squeezer on hand, use a kitchen tong and press firmly half a lemon using the center of the clamp. For potatoes that tend to germinate early, just add an apple in the bag to slow down the process. It is sometimes a bit difficult to peel the shell from hard boiled eggs. Add 1/2 teaspoon of baking soda to the cooking water before boiling the eggs and they will be much easier to peel. Brown sugar tends to dry out, but by placing 2-3 marshmallows in the container, it will solve the problem once and for all. If you have corn silk remaining stuck on the corn when peeled, you can easily remove it with a toothbrush. Here's the tip to cut several small tomatoes at the same time. Place the tomatoes between 2 lids and pass the knife through the lids. You will have a multitude of sliced tomatoes quickly! Make the most delicious ice cream bowls by baking your cookie dough on the back of a muffin pan. All this tips will make your life easier! Which one surprises you the most?